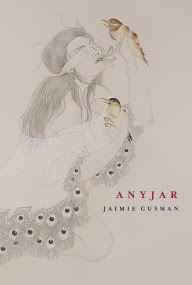 For Gusman, her “anyjar” as a focal point contains multitudes, from memoir-ish narratives and short scenes to lyric sequences that write on jars, the body, family reminiscenes and just about anything a jar might contain. The blend of styles and subjects are an intriguing mix (although some of the more sprawl-y poems tend to get away from her a bit; the prose-poems remain the strongest pieces in the collection), and the through-line of the “anyjar” manages to hold the collection together quite well. I’m a big fan of collections composed and/or compiled as “catch-alls,” which make me wonder what direction she might move for any subsequent collections. Catch-alls as well, or structures held together in different ways? Forgive me, he says, I took the Anyjar and buried it in snow until part of the glass froze and then I tried to break the Anyjar apart with an ax that was underneath the kitchen sink, which I discovered when rain caught the slate-stick and with one, two, twenty smashes the Anyjar wouldn’t budge, which meant that the ax wouldn’t do so I went to the bedroom where I found a chain-saw, revved the engine like a quake of earth and sawed the hell out of the Anyjar, but what happened next was disappointing because nothing shattered except my right knuckles and all bloody and in a bad mood I called a friend to help and the friend said I’ll do anything I can do anything to help a friend so the friend came over with very new rubber gloves and twisted the Anyjar until the friend’s hands looked like new hands but of course we thought if the new hands wouldn’t do, any other hands would surely fail to open the Anyjar, so then I thought extremely hard about everything and we began to make a catapult from space and flung the Anyjar into the air but it boomeranged right back only to hit the friend in the anything-but-good eye so I ran to get some frozen peas and a patch, and then I got tired so I suggested that maybe the best thing to do was to go get a blanket (take the one the dog sleeps on) and drape it over the Anyjar and just like that I sighed and the Anyjar disappeared—so forgive me he says sorry again, it could be anywhere.